A friend recommended writing down how special drives made me feel, so that I could relive them over and over. So I took her advice and wrote about driving the stunning mountain pass between Dalat and Nha Trang. I decided I should make a habit of doing it whenever something special happens. Motorbiking through Vietnam solo meant that I often wasn’t able to capture the stunning roads I was drove, especially as every turn produced a view that was picture-perfect! So here goes another little explosion of the thoughts that ran through my mind when I finished the drive from Nha Trang to Quy Nhon. They’re mostly just memory-jogs so I don’t ever forget the feeling of complete freedom and heartwarming bliss from this drive. The roads in Vietnam are intoxicating. Just when you think you’ve had the best view of the day, another appears. And another. Then another. Today: Beach. Mountains, cliffs and rice fields. Farmers. Non la hats bowed down in the rice fields. Sloping twist and then a blue bay. More like bae. The beach empty. Blue sky, blue water. Blue. Cliffs, the perfect view point. Fishing boats colourfully bobbing. Rocks dotting the bays. Blue:Turquoise. I didn’t know Vietnam could have such pristine waters. Green:Lush. You don’t see this if you only go to the cities. Small towns and street food. Friendly faces and open hearts. Happy music on repeat: time to run. Happy smiles from passersby. Mesmerising views. I need to come back here. Racing alongside the northbound train. I won. Three kids in a row flying kites. The locals here live such a simple life. It reminds me that sometimes its the simple things that make you happy. This has been so true for motorbiking through Vietnam – spending hours on the road, sometimes just witnessing others living, immersed in the simple beauty they live everyday, is enough to fill up your soul with love. As with many of the roads in Vietnam you will have to leave the city before you get onto nice roads. 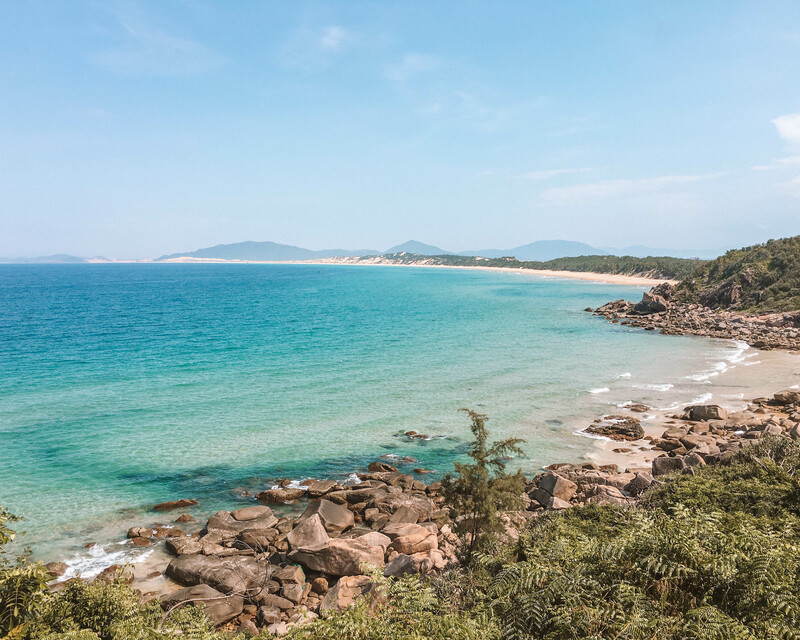 It didn’t take long on the way out of Nha Trang to sink into beautiful scenes but I did find that for the most part the roads around Tuy Hoa and onwards were pretty dull (just highway with cargo trucks and pollution) until you get near to Quy Nhon. The beautiful part of this ride is between Nha Trang and Tuy Hoa. 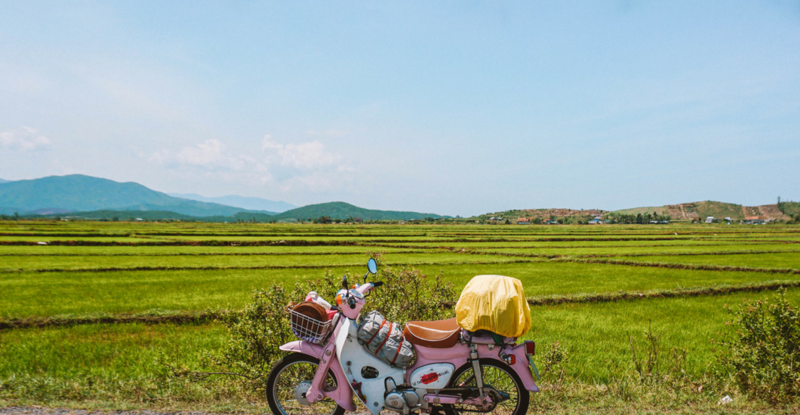 Even if you can’t do the whole ride I recommend escaping Nha Trang for the day to explore the rice fields and beaches to the north. Enjoy this post? Pin me!